Some time ago a friend of mine was in Paris and I asked her to bring me some beauty products from Sephora. 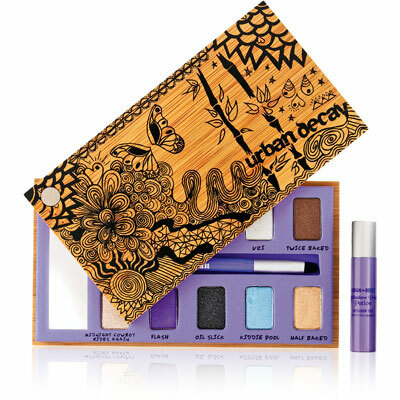 Among other things I wanted the Urban Decay Sustainable Shadow Box and today I want to show it to you. The colours are mostly well-pigmented, some are glittery, some really smooth, the colour payoff is incredible and there are no matte colours in this palette. I mostly like Flash, Oil Slick and Half Baked. Grifter, Uzi and Midnight Cowboy Rides Again are the most glittery in this palette and I have to say Uzi is the shade I like least. When swatching and applying you mostly get only the silver glitter and none of the silvery white eyeshadow. The rest of the eyeshadows is also great, they are easy to apply and to blend, so this palette is definitely worth a look! not only great colors, but i love the box design!